I will be the first to admit it, I really let myself go during vacation. I wasn’t racing so I ate, drank, lay around, cruised for a few weeks and drank some more. It wasn’t a catastrophe, but I ended my vacation with that uncomfortable feeling when your clothes have gotten a little tight and you avoid being in photos. When I got back on board for this contract, I got back into the gym, but wasn’t really feeling committed, more lackluster and missing my outdoor triathlon training. Then along came the most wonderful trainer and a group of colleagues from different departments. Together we have all begun a 30 day fitness challenge. We have all made different goals that we would like to achieve, but it all centers around the basic principles: Eat Clean, Train Dirty and work hard together. We train together, bootcamps, cycle classes, whenever possible, and are always there for each other when we have tough days. It’s a truly amazing group of people. We have representatives from many different departments and each person brings something fabulous and individual to the group. Everyone is at a different fitness level and has very different goals but we are all there for eachother and always so supportive! I’m really excited about it. I feel amazing and strong and my passion has been renewed. I’m back into tri training full force as best I can with diverse treadmill workouts and challenging spin classes. Of course, I’m not getting any swimming in, but when we get back to the Caribbean I sure will! If anyone out there has any off-season treadmill workouts to share, I’d be thrilled to add them to my list!! Well, being a gym rat is going quite well actually, I’m getting into a comfortable groove of running/biking/weight training in the guest gym. 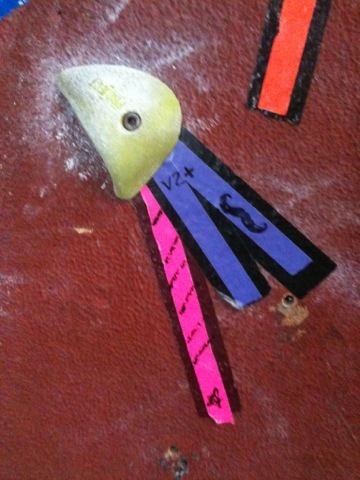 My schedule is actually ideal for training. I work split shifts so I always have time every day to go to the gym. We don’t ever work all day straight, there’s always a break! I really feel like I’m getting so much gym and self improvement time, it’s amazing. The only thing missing is swimming. Of course, swimming is the component that I have to work hardest on to keep up. 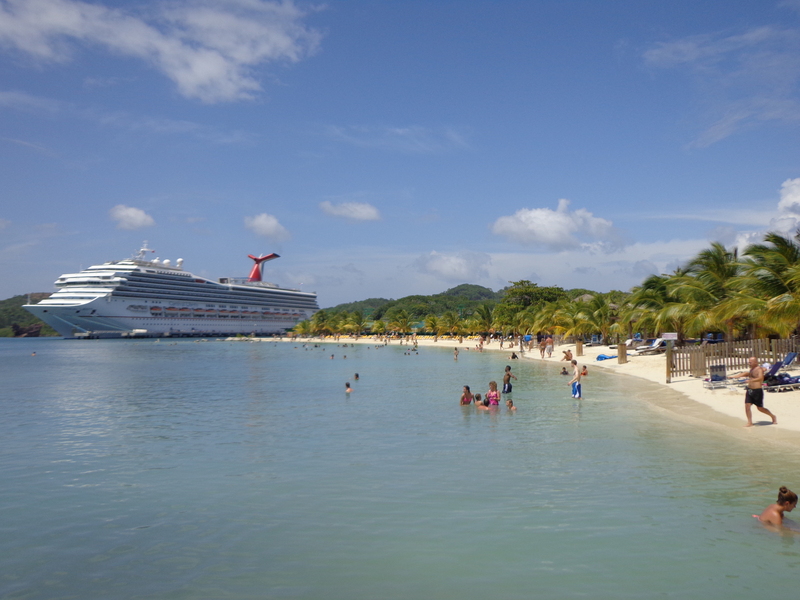 My current solution has been to swim back and forth along the beach when we are in ports with a close beach. Which is at least 2 days a week. Sometimes I can’t get off the ship, but I’ve been making do! One thing that I can’t get enough of right now is the eucalyptus steam room and dry sauna on the ship. The wall opposite to the door is actually a massive floor to ceiling window that looks out onto the ocean. There is nothing better after a workout than sitting in the steam room and staring out at the ocean. It’s heavenly!! I’ve also discovered napping!! It’s amazing!! How did I live without naps before???? Does anyone out there have any advice for me in the triathlon department?? How can I maximize my gym workouts to keep me in shape while living on a cruise ship all winter (pool swimming is out of the question, crew aren’t allowed in the guest pools, originally I thought maybe I could do some pool running)?? Isla Roatan, Honduras. My floating home on the left!! Wanna race to the ship?? Goofing off with a co-worker in Roatan! Where did you train today?? So now that I live on a cruise ship, I’ve been focusing my training on rehabilitating my ankles after how badly I destroyed them this summer. I started by walking on an incline (12) for 25 minutes then running for 5 minutes, like my physio told me, and have slowly been working up a minute a day. If the cankle complains, I run the same amount of time the next day. Then when it’s happy again, I increase by a minute. 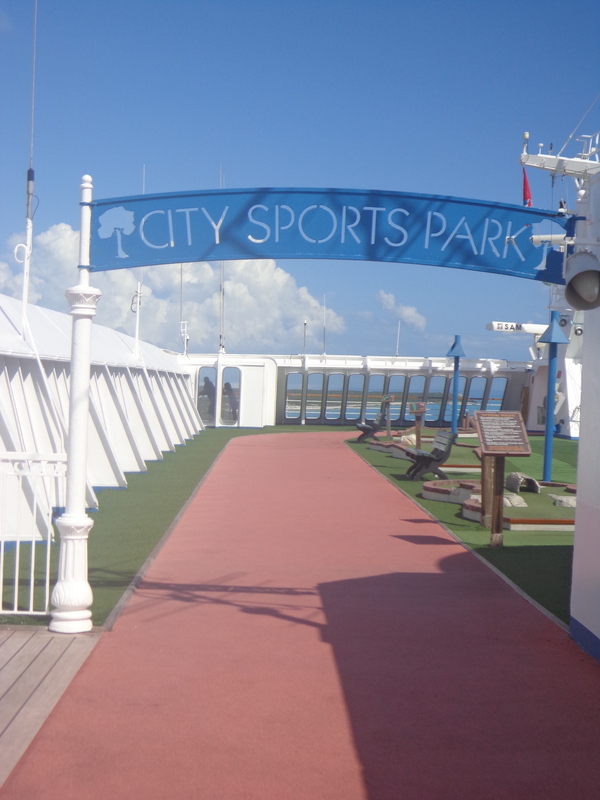 I just got clearance to train in the guest gym, which also means I can run on the Sun Deck track!! Check it out!!! Where did everyone else train this morning?? 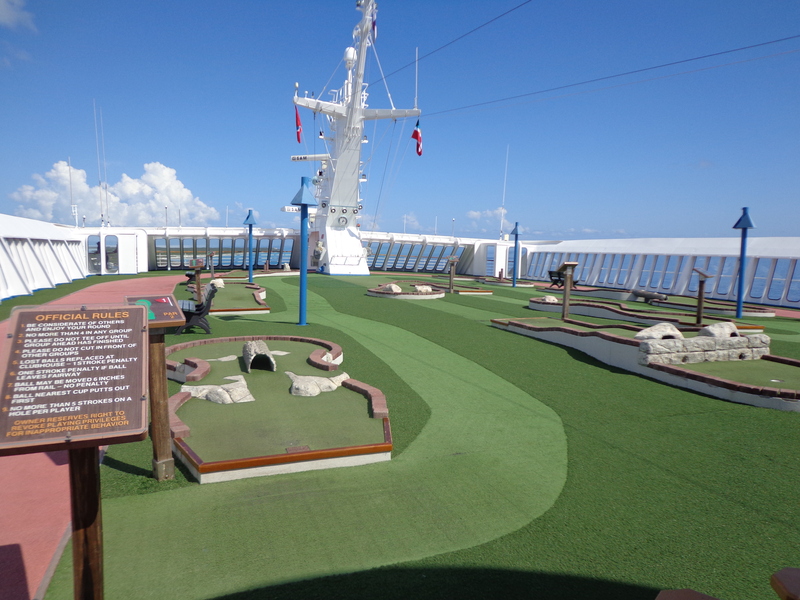 Oh, and yes, on the right that IS INDEED a mini golf course!!! Check it out also!! I have been a little absent for the last few weeks and I’m sorry about that….partially it’s because of an injury and partially I’ve been away. 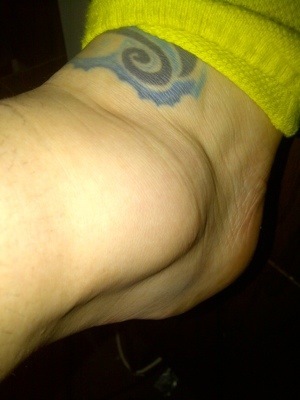 Let’s start with The Cankle. 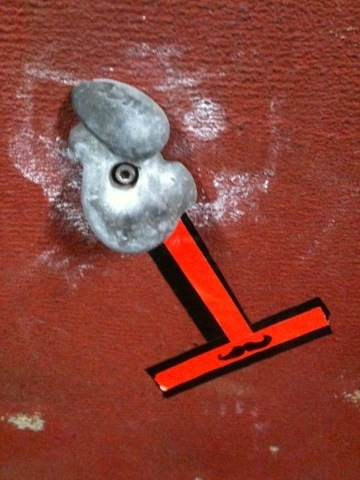 No matter how hard you try to prevent injuries as an athlete, it still happens. I work so hard to prevent injuries while I’m racing and training, and I very rarely injure myself during a race. However, two weeks ago, while walking back to my car with a coffee on my way to work, I tripped. Possibly on the air, possibly on an invisible cat, possibly on Doris Gravlin (don’t worry, she and I are friends, I’ve worked at the VGC for 5 years and we are very close.) Whatever it was, I flailed and sprained my ankle so badly that I was advised to not bear weight on it. This happened four days before Tough Mudder, which I wasn’t planning on missing. And I did not. But anyway, after this little mishap, my ankle swelled to a RIDICULOUS size, so much that I began calling it The Cankle, and making people do it’s bidding. Check it out….. So that’s The Cankle, and somehow the Cankle and I managed to run 18 km with 25 obstacles. More on that later. For all the other athletes out there who are cursing me for racing on this ankle, don’t worry, I’m paying for it now, but I’m stubborn and couldn’t not race. Sooo please forgive me, I’m a bad athlete, I don’t know how to rest. So, during my race the other day, I had a lot of time to think. People often ask me what I think about while racing, especially during the long runs. It varies, I think about a lot of things, but during this particular race, I thought about why I race. I love triathlon, it’s fun, challenging, scary, an adrenalin rush, and it makes me test my limits. I find it a very interesting balance of preparedness and living in the moment. We spend so much time training, planning, preparing and generally working so hard for these races and then once you get there, it’s the ultimate living in the moment experience. When I’m racing, I feel so alive. From the sound of the starter horn, to the chill in the water, to the pack of other excited athletes all around me, to the aching in my legs while struggling up a big hill, to the beads of sweat traveling down my body, I am 100 percent in the moment. And once that moment is over, there is another moment to make the most of, and that new moment is all encompassing. Triathlon, to me, is stringing together a series of perfect and imperfect moments to make one amazing event. And when it’s over, all I want to do is whatever it takes to be stronger and faster for the next race. That is why I race. I race for the non-stop adrenalin, and the feeling like I might either die or conquer the world, once I make it to the top of the next hill. 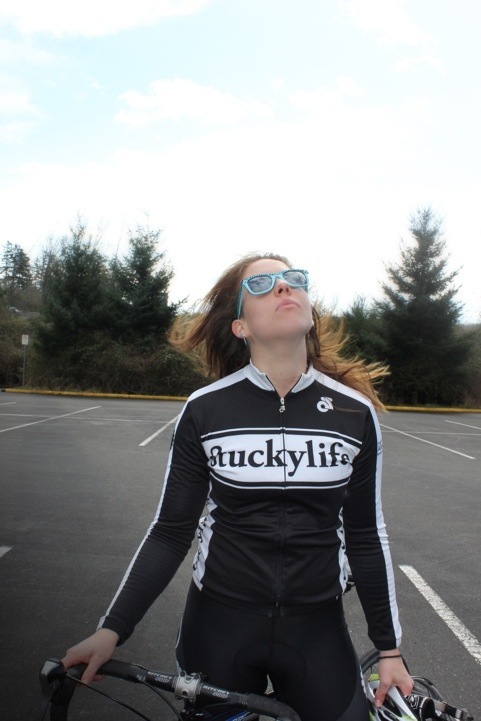 Triathletes are also some of the funniest, most insane (in a good way) people I’ve ever met. It’s nice to be surrounded by people who don’t look at you like you’re crazy when you talk about how much you train. Obviously there’s a few duds in the group, but that’s just the nature of human beings. During a race, you can always count on endless support and camaraderie from your fellow athletes. At the end of the day, I think we understand eachother, and that we are all chasing the same string of perfectly flawed moments that make this sport so amazing. Well, I have totally recovered from the half marathon. I stayed off the knees, had several ice baths, iced my knees lots and stretched plenty. And also consumed ALL the glutamine. I didn’t run all week, but I did swim everyday. My first tri of the season is coming up in 10 days and I’m so so so excited. Anyway, I wanted to take this opportunity to introduce a very important new friend that I’ve been training with the last few weeks and whom I’m growing very attached to! 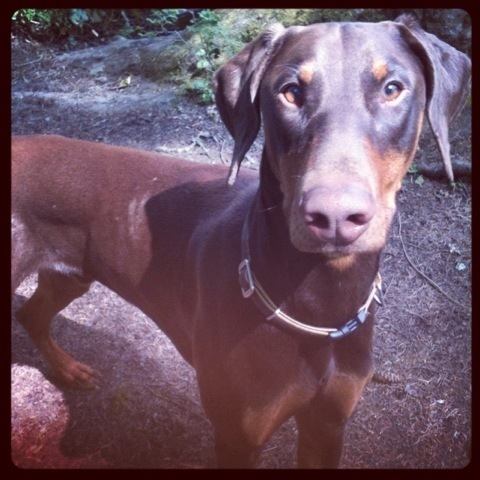 His name is Copper and he’s a red doberman puppy (well he’s almost a year old). He belongs to my friend Mike, and I’m fortunate enough to be able to bring Copper with me on my adventures. If you haven’t trained with a dog friend before, it can be very rewarding. First of all, training with a buddy of any kind can be very beneficial, you don’t want to let you training partner down and wimp out. Even if it’s a puppy! Copper and I go on mountain runs, and run around Elk Lake, and generally cavort. Now, if you’re going to train with a dog, there’s several unspoken (and spoken) rules that we all must follow. So here for you all is my list of tips and things to remember when training with animal friends in public!! Caveat: Keep in mind, I do not claim to be an actual dog trainer, but I am experienced with animals. 1. Know that your dog will come back to you when you call him/her. If you’re going off-leash (not allowed in some places), make sure that your dog will come back when you call him. If it’s your personal dog, this is a little easier as you are the one who’s training him (if you aren’t prepared to train your dog, don’t get one….at least not a big one), as Copper isn’t my personal dog, I made sure before we went on our first adventure, that Mike told me his call word, and that I had treats. As soon as we got to the mountain I made sure to call him to me several times, and gave him a treat so he knows that I’m his human for the day. Now that we know eachother, I don’t worry at all about him running away and coming back because I’m confident that he comes when I call him. 2. CLEAN UP AFTER YOUR DOG…this seems like a no-brainer, but really, there’s nothing worse than stepping in random dog poops. Be considerate of the other people using the park/trail/public area, bring bags and clean up your dog’s poop. 3. Be aware! Especially if you have a big dog, be aware of other people’s feelings. Even though I know that Copper is the sweetest dog alive, not everyone knows him, and not everyone likes dogs. I like to call ahead if we are approaching strangers from behind and say something like ‘friendly dog sneaking up behind you.’ Or if they see us coming, just saying ‘he’s super friendly’, or something like that. 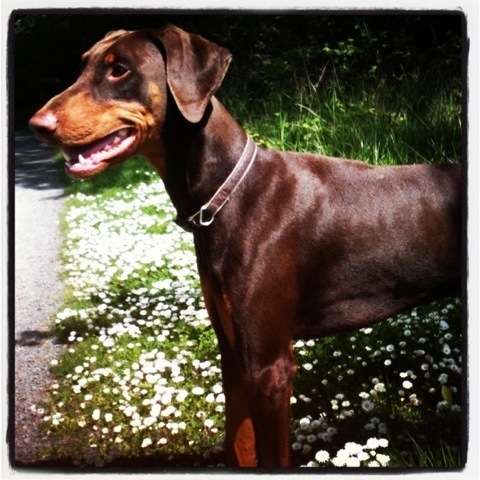 I find that especially with Copper, there’s a bit of a doberman stigma (even though they are the sweetest dogs), and even if you aren’t afraid of dogs, seeing a random large dog running at you full speed can be unnerving. Get a dialogue going with the people around you and you won’t run into problems. In the same vein, if you know that your dog can be funny about other dogs, or people, or bikes, or horses, make sure you prepare him appropriately if you see one of those things. If I see a family with a bunch of little kids I have Copper sit beside me and let them pass, not that he would do anything other than run over and sniff them, but small children are easily frightened and I would hate to be the cause of a child’s fear of dogs! Those are my three big rules for harmonious training with a furry friend in tow! Since it’s practically summer here on the west coast, I plan on being outside as much as possible with my new friend! Well, I just got home from running the Oak Bay Half Marathon. It was several different things. It’s such a beautiful run, being along the water a majority of the time. Mostly it was long. My knees aren’t a big fan of running that far right now, which is really my own fault. When I was living in Banff I was really focusing on my running and I got to be in really fabulous running shape. Which I am not now. I need to focus more on running more often. However I ran it in 2 hours 10 mins, with dying knees. I’m not super pleased with that but also not upset about it. Overall it went quite well. I have to just address one thing about racing. I’m totally one of those people who throws full cups of water all over my face during a race. Some people might do this to cool their heads/bodies. But for me, this is for two reasons. 1. I’m just not co-ordinated enough to run and drink from a paper cup at the same time. Seriously. It’s just splashing all over me because I can’t manage to drink and run without covering myself in water. 2. I’m afraid that if I stop to drink, I may not be able to start running again. You know, you get that running groove on and don’t want to interrupt it. So really my solution to these problems is to throw the cup of water in the general direction of my face and open my mouth and hope that I catch some. So if you ever see me or someone like me throwing water on their face, remember this, because maaaaybe that’s what’s going on. So, I’m currently curled up on the couch, soon I’m off to ride a horse and then go for a bike ride! At some point in there I’m going to do something that I haven’t done since I was a gymnast. Have an ice bath. I’m feeling inspired by a post Triathlon Obsession wrote about it and I know it’ll make my knees feel better. Wish me luck!! 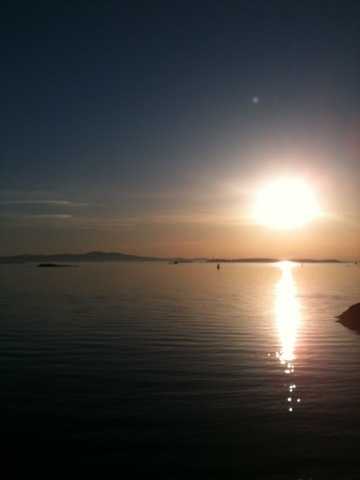 I’ll leave you with a lovely shot of the ocean that I took this morning on my walk to the race start!